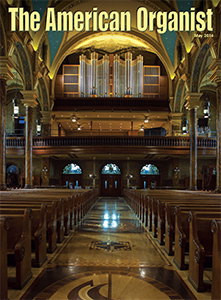 The American Organist Magazine (TAO), published monthly by the AGO, is the most widely read journal devoted to organ and choral music in the world. It is the official journal of the American Guild of Organists and the Associated Pipe Organ Builders of America. Subscribe now! Casavant Frères and JL Weiler Inc.
Click here to read the cover feature article. An important benefit of Guild membership is the enormous communications network provided not only through personal contact with colleagues locally and nationally but also through TAO, which keeps members up to date with the profession by providing both scholarly and practical features and timely news of the Guild and its members. Positions Available listings in TAO keep members aware of employment opportunities nationwide. Members automatically subscribe to The American Organist when they join the American Guild of Organists. The AGO membership year is July 1 through June 30. The American Organist (TAO) Magazine subscription year, however, is December through November. This difference allows time to update The American Organist mailing list following the annual collection of membership dues. $162 for three years ($210 foreign and Canada). Single and back issues of TAO (from 1981 to the present) are available for $8.00 each, plus shipping.